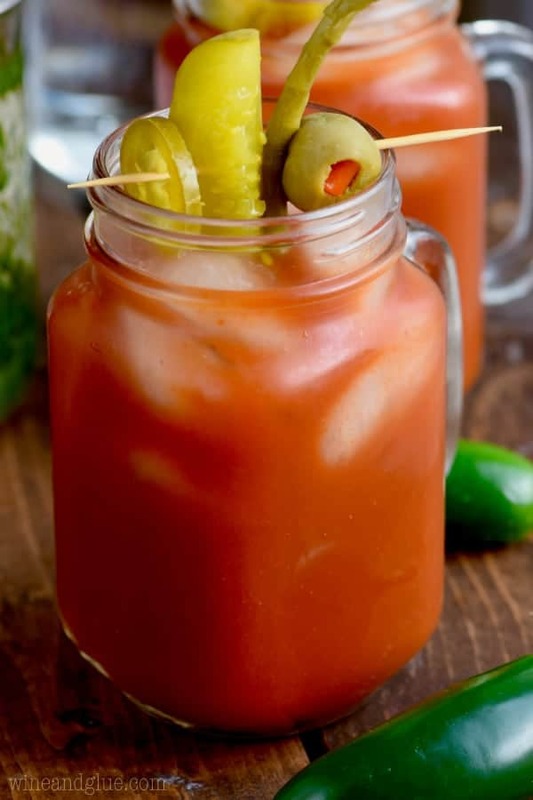 These Jalapeño Bloody Marys have the delicious smoky flavor of jalapeños in vodka makes this bloody mary recipe a must make for any brunch! 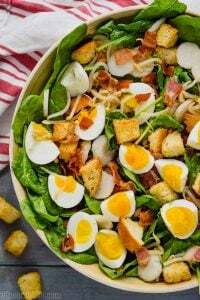 There is definitely something about the impending summer season that has me thinking about brunch. Like crushing hard on the idea of brunch. Like waking up in the middle of the night and fantasizing about the most amazing french toast creations washed down by the best Bloody Mary. Why the connection between summer and brunch you ask? I don’t know. There is something about sitting out on the patio of a restaurant and eating brunchy foods that just makes me so happy. Don’t the jalapeños look so pretty infusing? Yeah . 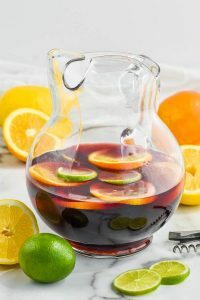 . . so when I was working on my 30 Great Summer Cocktails post, I came across this little gem from the lovely ladies over at A Beautiful Mess. Turns out that I thought it looked so yummy that it imprinted itself on my brain. So this is definitely inspired by them. 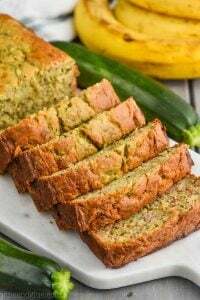 The recipe itself is a Lisa Original. I just kept throwing things in until I was happy. It is spicy y’all. So spicy that I was forced to use the word y’all. But it is yuuuuuuuummmmy. Okay, off to enjoy my super non original beverage, the very one pictured in fact, that has been waiting patiently for me all day. Fill a pint glass 3/4 of the way full with ice. Combine all ingredients and stir well. Garnish with all sorts of delicious things. Enjoy! 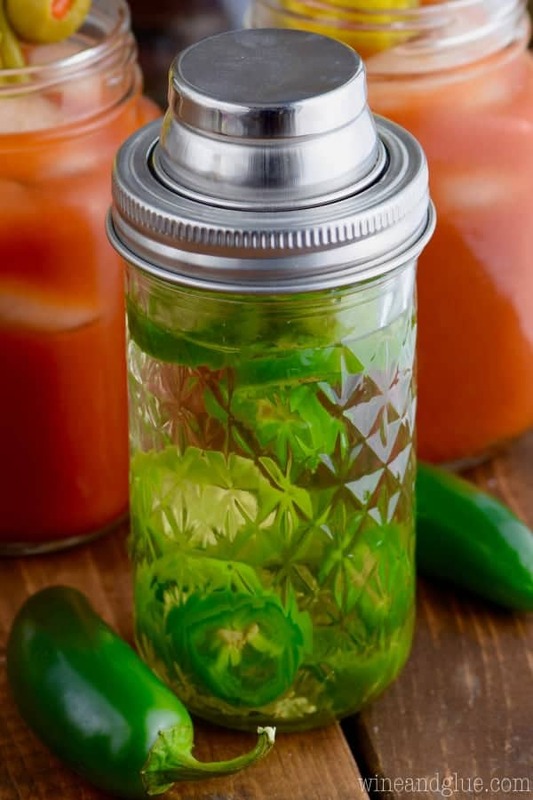 To make vodka: Put the jalapeño slices in the jar. Fill the jar vodka. Let the vodka rest for at least 24 hours. 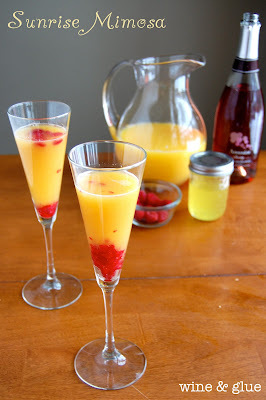 Looking for another brunch beverage? Ooohhh…. 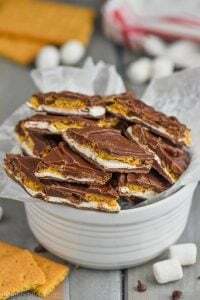 Lisa – this looks divine! Now, we drink Caesars ’round these parts, which I’m assuming is just a Bloody Mary, but with the clam and tomato juice instead of plain tomato juice? My brother got married in Canada, and we had Bloody Caesars . . . I was not such a fan. But try this with Clamato juice and tell me how it is! Maybe the jalapeño taste would overcome the clammy taste and I would like it. Okay, so I’ll have to trust you on this one – I’m a little afraid of tomato juice. But everything else sounds SO good. I’d never have thought to put jalepenos in vodka! I feel like we would have fun drinking together. I can feel my upper lip beading already. Is that weird?! Oh my gosh! 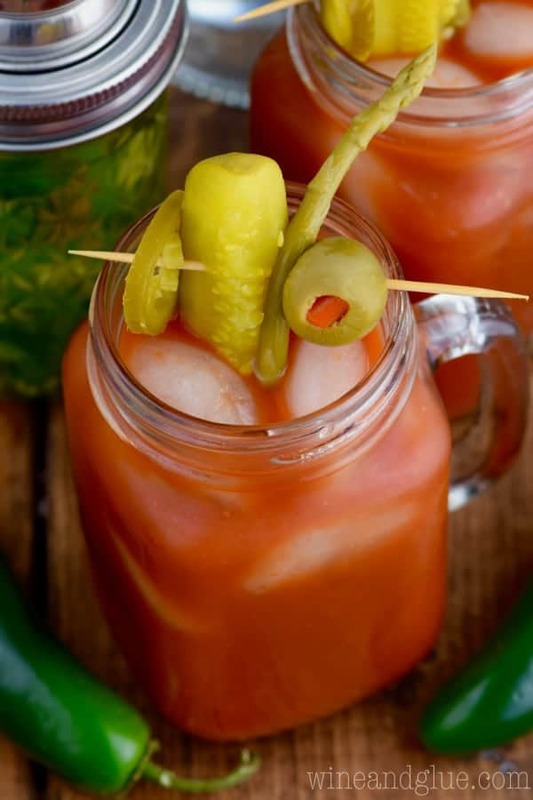 I’ve NEVER heard of anyone else using pickle juice in their Bloody Mary’s! It’s the only way I’ll drink them 🙂 This sounds like a fabulous recipe too! 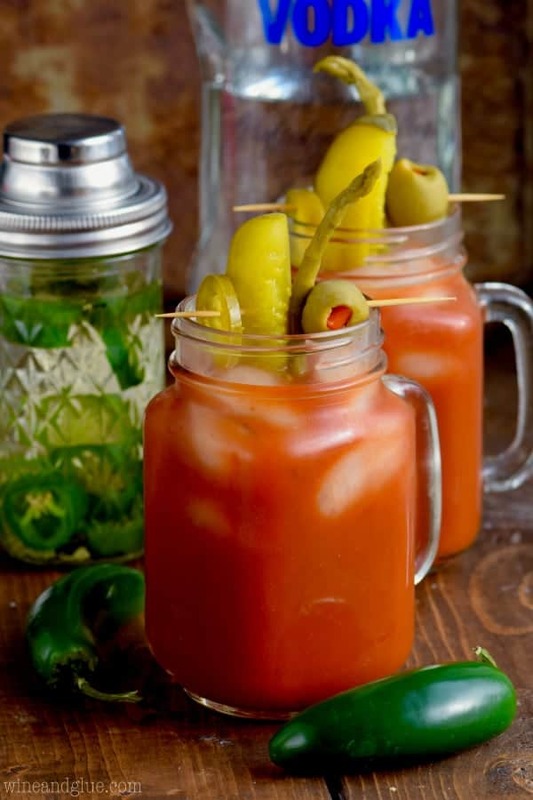 I can’t wait to make some jalapeno infused Bloody Mary’s! I just so happened to have a giant thing of V8 in my fridge that I needed 1/4 cup for, for another recipe. Looks like I need this bloody mary to happen! It was meant to be! Thanks Averie!